How Do You Find the Mode of a Dataset? 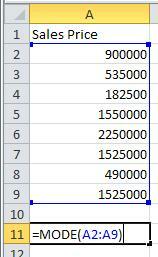 Sheets or Excel can be used to find the mode of a set of data. Previous PostHow Do You Compute the Sample Mean or Variance in a Spreadsheet?Next PostHow Do You Find a Population Mean with a Spreadsheet?